Can I hold my clarinet while I host this concert? So, running the panel was kind of like teaching, but doing it on a concert stage was a little weird. I’m more used to doing this kind of thing right before I play a piece – and I had just done this last week when the UMaine faculty played Pierrot lunaire on our weather-delayed concert. Then, I got to exhort the audience to “go get the translations!” when it became clear that no one had picked up the program handout of the texts. It’s kind of fun to see people move quickly when you ask them to. And doing this while you’re holding an instrument alongside other people holding instruments makes for a better impression – the audience assumes that you’re not going to talk forever, since you’ve just warmed up to play. As it turns out, the panelists in New York made pretty pithy comments, and there was some laughter during both presentations, so there were pleasant endings to both evenings. And, I can go back to my hosting-while holding-an-instrument role in a concert coming up next month. 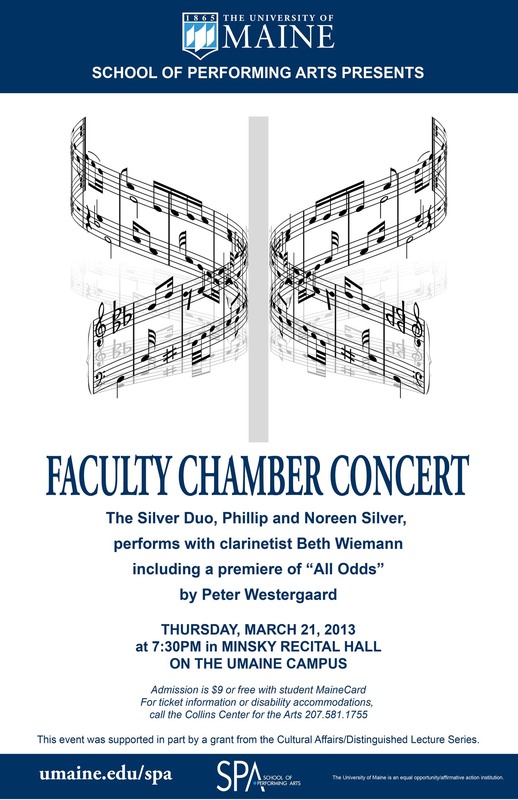 Then, on another UMaine faculty concert, Phillip, Noreen and I will premiere a new piece by, of all people, Peter Westergaard.